An eerie, high-pitched bugling like a demented New Year's Eve reveler with a loudspeaker whistles across the valley at the eastern edge of SLO County. 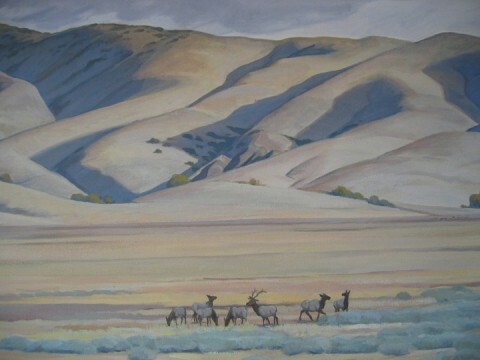 WHERE THE ELK AND THE ANTELOPE PLAY : Californias unique tule elk, once nearly extinct, are now thriving at Carrizo Plain National Monument, as depicted in this section of a visitors center mural by John Iwerks. # Wildlife biologist Bob Stafford focuses on a much fainter sound beeping through the static of a receiver slung over his shoulder. Striding across a grassy slope, he holds an antenna high over his head under an expansive blue sky. "Where are you?" he says into the wind, as the rhythmic beep becomes louder and faster. "Okay, somewhere in this bowl." On a nearby hillside, dozens of furry, buff-colored animals cluster into a grazing group. 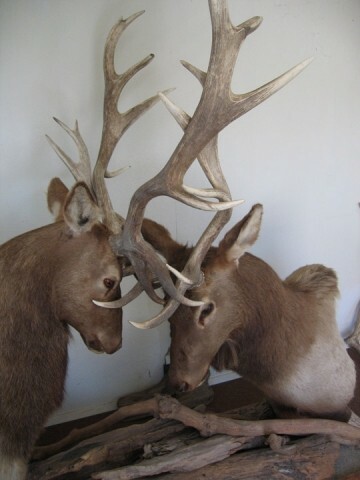 More massive than deer and almost as big as cattle, these are California's unique tule elk, who stared straight into the face of extinction a century ago. Historically grazing California's grasslands and oak savannahs in vast herds so numerous they were known as "the buffalo of the West," for eons tule elk roamed the hills, river valleys, and coastal bluffs all over San Luis Obispo and Santa Barbara counties and throughout the grassy expanses of the Central Valley. But the Gold Rush of the mid-1800s changed everything for these majestic animals. Easy pickings for anyone with a rifle, they were seen as money on the hoof due to demand for their meat and hides, and herds were quickly decimated by eager opportunists. By 1873 when the state Legislature banned all elk hunting there was serious doubt about whether any tule elk were still alive. A couple of years later, a mated pair was spotted deep in the tule marshes on a remote ranch in Buttonwillow, just east of the SLO County line. Along with a few other females hiding in the swamp, these two thanks to human interference were the last tule elk on Earth. Today, with the cooperation and support of the same species that once decimated their population and habitat Homo sapiens tule elk are making a comeback. The otherworldly bugling of the bull elk is a common sound in Pozo these days, where local residents driving their kids to or from school often stop to admire a free-ranging white-rumped herd grazing near the road. Hundreds more wild tule elk make their homes in the eastern part of the county: California Valley, the vast Carrizo Plains and the adjacent Chimineas Ranch, the Avenales Ranch, and Cedar Canyon north of Hwy. 46. 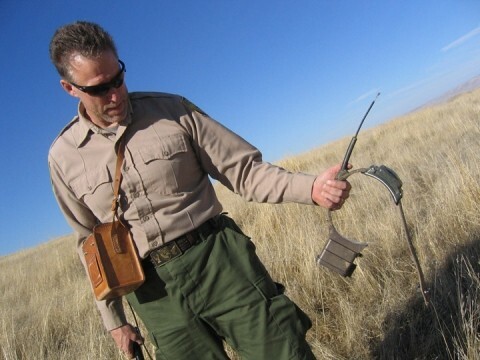 COLLARING THE DATA : Fish and Game wildlife biologist Bob Stafford retrieves a radio collar worn by a SLO County tule elk, with its black box loaded with information about nearly two years of elk movements. # Stafford is part of this success story. As an associate wildlife biologist with the California Department of Fish and Game, he tracks SLO County's tule elk with the help of radio collars like the one he's searching for this mid-December afternoon. The beeping grows more insistent as he changes his direction to beam in on the sound emitted from a thick collar and its "black box" of information. A female or cow elk wore the collar for nearly two years before it was automatically released a few days earlier by a signal issued from an airplane that Stafford flew over the herd. With a triumphant "Ahhh!" he plucks the collar from a clump of native bunchgrass and cradles the sturdy black box in his big hands. "This black box recorder has it all now. It cost $3,500, but the amount of information you get from it is worth way more than that," he says, his eyes gleaming. For months, the GPS unit has recorded the location of the elk every four hours, allowing scientists to discover exactly where the herd roams throughout their yearly cycle of mating and calving, and how long they stay there. It's valuable information for managing the elk population and habitat. "Look at this map we generated from the information on a collar I picked up in September. It shows where the herd spent the summer. We thought they'd be closer to the main water source, but they were in another canyon next to a smaller spring, which must be just big enough to support the herd," he says as he points to a dot-covered map of the rugged land just north of Highway 166. Fish and Game staff re-introduced tule elk into SLO County in 1983, releasing 20 at the Avenales Ranch and another 120 in the Pozo-Carrizo Plains area two years later. Now, Stafford says that his latest aerial count, conducted during late November, shows there are around 800 in the county. "It's the best conservation success story. They went from 500,000 to five in 50 years, and now they're thriving. Tule elk are the most successful reintroduced mammal in California," he says with obvious pride. HOME ON THE RANGE : One of conservations best success stories, tule elk are increasing in SLO County and around the state, all descended from just one bull elk and five cow elk that survived hunters bullets in the 1800s. # Five more elk collars are waiting for Stafford to retrieve them, each one emitting a beeping signal that his receiver picks up. Along Highway 58 in California Valley, a signal grows louder near a privately owned cattle ranch. A quick phone call to the landowner yields permission to pass, and Stafford hoofs it across the tawny grassland to tune in on the signal from the collar which turns out to be still attached to a moving elk. Another collar in the area is easier to find: It's attached to a clean-picked skeleton of a cow elk. "Sometimes bad things happen to good elk," he reports in a phone call to his supervisor. Down the road, at the end of Highway 58 just past Buttonwillow, the Tule Elk State Reserve protects the spot where the last remaining tule elk were discovered more than a hundred years ago. Cattle baron Henry Miller played a crucial role in preserving the species found on his land, issuing strict protection orders to his employees in 1874 and offering a $500 reward for information if anyone disturbed them. The herd increased rapidly, and by the early 1900s Miller attempted with the help of the U.S. Biological Survey, the California Academy of Sciences, and others to round up and transplant elk to public parks and zoos around the state. Many animals died, but wild free-ranging herds were eventually established in the Cache Creek area of Colusa County and the Owens Valley on the east side of the Sierras. The Buttonwillow herd was also the source for the first 20 elk relocated to SLO County. Today, around 30 or 40 tule elk live out their lives inside the fences of the 1,000-acre reserve, which was set aside as an elk sanctuary in 1932 when it was still a lush wetland full of willows and cottonwoods. Nearby drainage projects turned the land to an arid, barren-looking range in the 1950s, till a solar-powered pumping project recently re-created some ponds. State Park Ranger Bill Moffatt is happy to show school groups and other visitors around the Tule Elk State Reserve. "Look, there's the remnant antler from elk-zilla," the ranger quips as he points to a dead cottonwood tree uprooted on its side. Bull elk grow antlers each year, with the older bulls eventually sporting full racks they can use for head-to-head combat. Two big males at the sanctuary met an unusual fate when their huge antlers became intertwined during jousting. Their stuffed remains make an eye-catching display at the visitors' center. "This antler point stabbed this bull in the head and killed him, and the other bull carried him around for awhile till he died too. It was a case of 'till death do us not part,'" Moffatt tells visitors at the Tule Elk State Reserve. ANTLERS AWAY : Jousting male tule elk found their antlers fatally intertwined before ending up as a display at the Tule Elk State Reserve. # Wild-ranging tule elk can be spotted from the Guy L. Goodwin Visitor Center at the Carrizo Plain National Monument, reflecting the images in a mural painted more than 10 years ago by Santa Barbara artist John Iwerks. "When that mural was painted, you never saw tule elk down in the valley. But two years ago we changed our grassland management to allow taller grass, and now the pronghorn antelope and the tule elk are here," Stafford explains. He says he's "real excited" to recover the information from the radio collars' black boxes he's picked up. In January, Fish and Game officials plan to fit the collars onto two more female elk, and for the first time two bull elk too. It's not an easy process. A hovering helicopter drops a net over the selected animal, and Stafford runs in. "I lay into the haunch with my knee, and wrestle it to the ground, where I hold it till the team comes in to put on the collar," he says. Fish and Game veterinarians are on hand to take blood samples and monitor the animal's health during the capture. With a bull elk weighing in at 700 to 800 pounds compared to around 400 for the females Stafford says he's been going to the gym to prepare for his wrangler role. Next month, the bulls will lose their antlers, before growing them again starting in spring, when they're covered with soft fur known as velvet. Bull elk often scratch their antlers on trees or fenceposts, and can also wreak havoc with fences and crops, Stafford says. As a financial incentive for landowners to care for the elk in spite of the damage they can cause, Fish and Game officials have started the Private Lands Management Program. Landowners with big-enough elk herds can buy hunting tags for $300 to $500. "They can sell them for what the market will bear, which can be $10,000 for a bull elk. That will pay for a lot of fencing it's a real incentive," he notes. A group of hunters and conservationists called the Rocky Mountain Elk Foundation is also interested in the continuing success of the local tule elk population. 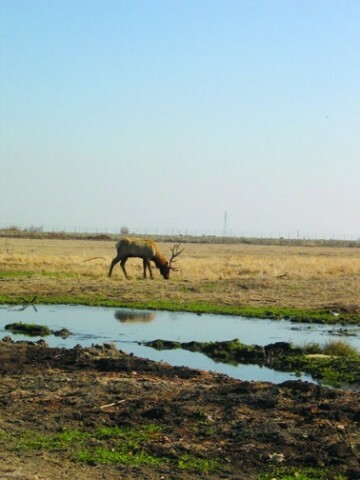 The nonprofit organization has helped wildlife officials install water sources to encourage healthy elk herds at the expansive Chimineas Ranch and the Carrizo Plains. "You can have really large herds here, with no conflicts with human use. If you can have tule elk with a large range, it means you have a lot of other species too. "As a scientist, I like how they fit into the whole big system, since for conservation you need a big area. Elk are relatively easy to count, and they're long-lived so you can see the slow building of their population. It makes them an accurate monitor of what's going on in the environment. They reflect habitat conditions," Stafford says. He carefully packs up the black box recorders in the back of his pickup, as the sun sinks behind the hills. His eyes sweeping across the grasslands where wild tule elk now roam freely, he smiles. "Elk are the symbol of the wild part of our county," he says. "We'll never get the grizzlies back, but we have the tule elk." E-mail freelance journalist Kathy Johnston at kjohnston@newtimesslo.com.